All your sketches are delightful! great use of gesture and color! Nice lines. I love your figure drawing. Very clean and expressive! Nice job! I'm sure the principal will treasure this. I really enjoyed the Sketchcrawl yesterday. It was especially fun to see everyone's work when we were done. Here's my sketch. 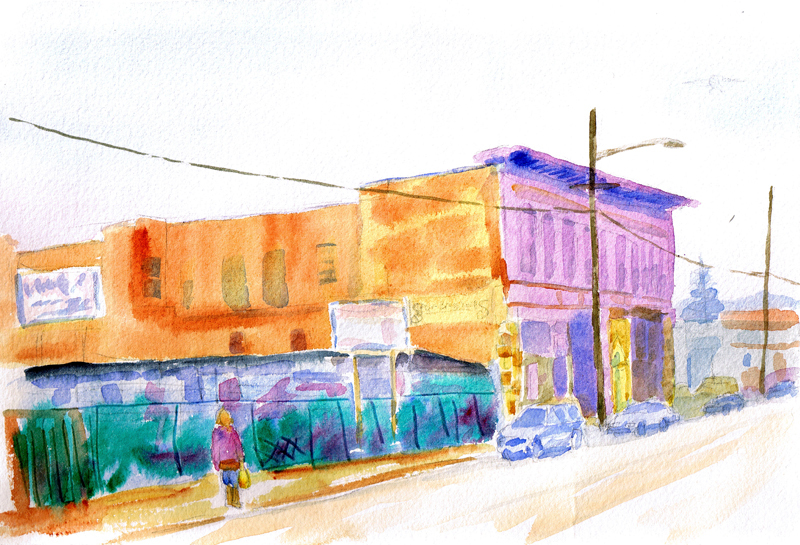 Beth - love your urban ink and watercolor sketch. great colors and perspective! Two of us from Silverdale are going to hop on the ferry to join you at Allegro Coffee House. Looking forward to it! Nice sketches, Pete. You've got a great eye for detail. How long does it take you to do a sketch? I think it would take me forever to get your level of detail. Really like the sketch with Pica. Great sketches! You're prolific. Even with a quick sketch, you capture the essential forms. Nice gesture drawing. I like switching from brush to pen. You're very accomplished at both! Really like your winter sketches. They're spare, clean and lots of white space. They really capture montana. Especially the garage scene with pickup. The woman in the hat is a great portrait. Love the hair and profile. Nicely done! Nice job, mathomas! I love the sky and clouds...nice flow. Good shadows, nice composition. I know what you mean about searching for a subject. Sometimes I spend more time searching than sketching!! These are great sketches. I love the ones of "Mr Intensity" in each of your posts. Sounds like a productive day! I think the banner is awesome! Love the humor! Nice creatures, too, especially the rhino. Cool!